Have you been wanting to try stenciling and just didn’t know where to start? This post on stenciling is full of steps and tips that will help you get started. My first stencil job was when I stenciled a floral design on an entryway table. I never would have guessed this table would have lead to me stenciling everything in sight and opening up my own stencil shop. 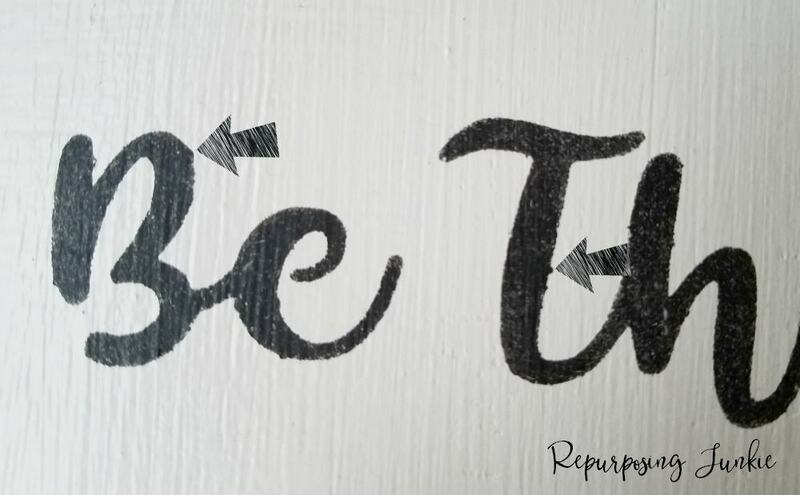 My love for stenciling, both designing and applying has lead me to write this post on How to Stencil: A Beginner’s Guide. It seems that every time I stencil I give tutorials to the imaginary audience in my head, working up the courage to share what I’ve learned with you; so I’ve decided to finally write some steps and tips on stenciling that have worked well for me, and I hope they will work for you as well. Choose the brush or method of your choice. I started out stenciling with a small acrylic brush. It was the smallest brush I had on hand at the time. After stenciling a few times, I decided to buy an actual stencil brush. You don’t need to buy an expensive stencil brush to do a great job. I buy the stencil brushes from Hobby Lobby in the packages and at Lowe’s and they work great! I prefer to stencil with the 1/2″-1″ stencil brushes but you just have to find which one works best for you and the stencil job you’re working on at the time. There are also pouncers, sponges, rollers and other methods for applying paint to stencils. There are many surfaces on which to stencil: wood, fabric, metal, walls, floors, etc. When it comes to paint I choose water based, so latex, acrylic, or chalky paint for easy clean up. There are tons of stencils out there to buy or you can even make your own. You can check out my list of online stencil shops where you can buy stencils. I also have FREE SVG & JPEG Files that are perfect for making stencils, if you prefer to DIY. The stencil files are found in my Resource Library which is a bonus to email subscribers. Tape down your stencil if you want to make sure it’s secure and won’t move when you’re stenciling. Painter’s tape usually works well for this. You can also choose to use stencil adhesive or get adhesive stencils. If you get in a hurry like me and just want to get to it, holding the stencil with one hand and stenciling with the other hand works fine too, and if the stencil happens to move, just line it back up and continue the project. Make sure your paint brush is dry! This is important, especially if you just washed out your brush and are switching to a different color and want to continue stenciling. If I am stenciling several different projects and want to keep using the same brush, but change colors, I wash it out and then dry it off in an old towel really well. Then I pounce it on a dry surface like a scrap piece of wood or cardboard, something that I don’t mind getting paint or water on, just to make sure all the paint and water is out of the brush. This is the most important part of a stenciling project!!! Paint is like salt, a little goes a long way. Load your stencil brush, pouncer or sponge and then get as much paint off of it as possible, while still keeping a very small amount on. You can keep a paper towel, scrap wood, paper plate, or cardboard nearby to pounce out excess paint. The amount of paint in your brush is key to having a successful stencil job. You never want too much paint in your brush when you go to your canvas. In this case, less is more. Your stenciling project will always look so much crisper and better if you just have a tiny amount of paint. I still have the occasional stencil project where I’ll either get in a hurry and not get my brush unloaded well enough or just not pay attention and end up with leaks through the stencil. Here’s what excess paint on the brush looks like; it usually shows up in little half circles. (I only pointed out 2 but if you look there are several more places that show excess. Honestly most of the time it’s hardly noticeable especially if the stenciled piece is far away on a wall or a piece of furniture, but this is what to look for when spotting excess paint on a stencil brush. When stenciling there are different methods, but I prefer to hold my brush like I would my writing pen, and pounce the brush in a straight up and down motion. I’ve tried the circular method and just didn’t care for it. I think you should just stencil with the method that feels comfortable in your hand and gets you the best results. When all areas of the stencil are covered in paint, you can wait until the paint is dry to peel the stencil off or if you’re impatient like me, gently lift it off, so as not to smear your beautiful work. Stenciled work usually dries super quick because you’re using such a small amount of paint. You can choose to put a protective coat (wax, polycrylic, polyurethane) over your beautiful handiwork, whatever protective coat that works with your project. Cleaning up stencils is easy, with warm water. I like to make a little bath in my sink with warm water, and soak the stencil, and peel and scratch the paint off. I usually wait to clean my stencils off after I’ve used them a few times. You don’t want to wait too long before cleaning them, otherwise your stencil becomes obstructed with paint, and your stencil area/design will start to look thin and not so great when stenciling. If this happens, just clean your stencil before using it anymore. Below is a picture of what a stencil looks like when it has been used one too many times and needs cleaned. You can tell that it’s getting gloppy and it will look thinner when applying, especially on the thinner areas of the stencil. If you’re timid about stenciling, practice on a thick piece of paper, like cardstock, to get the hang of it, and then move onto your intended surface. If you have never stenciled before, but really want to, go for it!! You’re going to do great!! I hope this post on How to Stencil: A Beginner’s Guide helps you in your creative endeavors!! Please share if you found this helpful or if you think someone else would enjoy this. Keri, that is a nice detailed tutorial. I’ve stenciled before of course, but if I hadn’t, this would be a good guide. What I’ve always heard is not to have too much paint on the brush. I have a project in mind that I might use a stencil for. Going to share this to my FB page…come on over & share it again so it gets even more exposure! Thanks very much Florence!! I appreciate you sharing it on Facebook! Keri, Thank you for all those great tips! 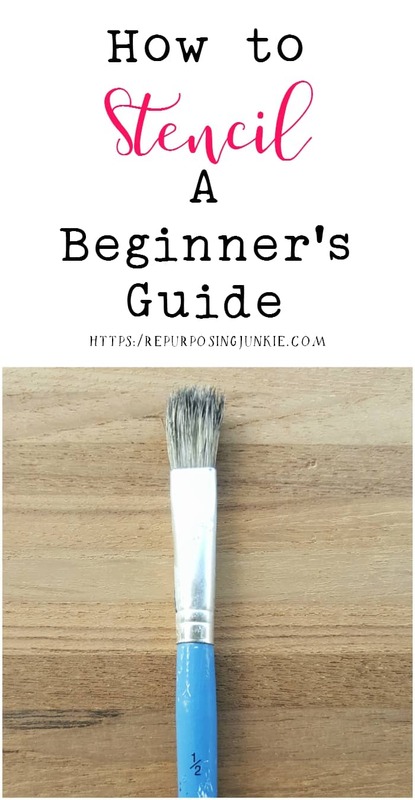 I did some stencilling a while back, or more like a year and a bit back, I haven’t done any in forever and I remember having hard times with too wet brushes and such, so it’s great to have this guide before getting started! Thank you! And of course that sign from a cutting board turned out lovely as always friend!!! Yay! I’m glad you found this helpful! Thank you Katrin! Wow these are really great tips coming from the Stencil Master! Thank you so much Keri. I am definitely going to pin this and use it a lot in the future. Younow make me feel less timid about using stencils.This was an excellent tutorial. Hahaha, thank you Mary!! I appreciate you pinning this! I’m glad this was helpful! Keri, thank so much for those tips! I’ve done stenciling with a trial and error technique so those will be very useful, especially #6. And I always wondered how to clean a stencil as I find it really tedious so tip #14 will make my life easier! I’m very glad this will be helpful Pili!! Yay! I love your tips Keri, beautifully written and they all make sense. I can’t wait to try them out on my next stencil project. They’re going to make a big difference. Hopefully my stencils will look as good as yours. Thank you very much Michelle! I’m glad they will be useful! Your stencils always look awesome!